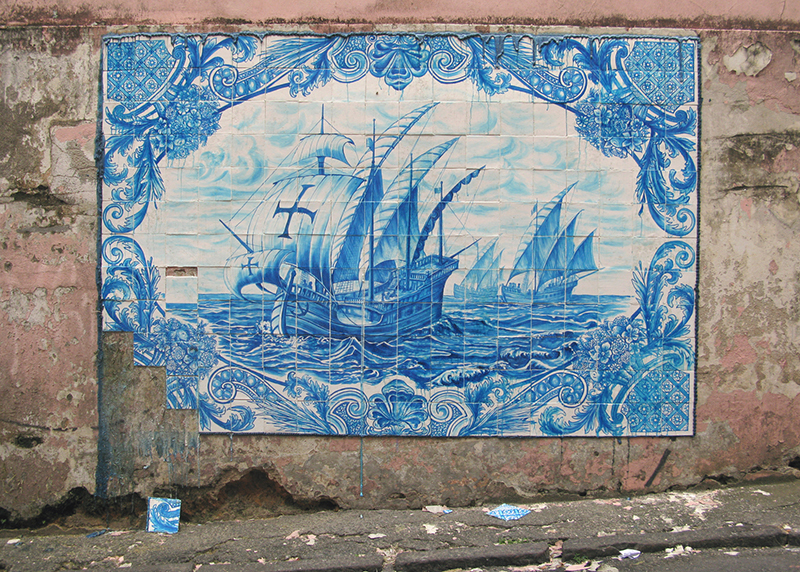 With Cargo (The Wealth of Some and the Ruin of Others) (2009), Shelley Miller reconfigures azulejos, the blue and white ceramic tiles that are traditional elements of Portuguese culture. Using sugar to reproduce the popular motif of clipper ships, she hints at the history of the state of Bahia through the sugar trade and slavery. The work, designed to be gradually eroded and destroyed by the weather, was photographed as it disintegrated. The trompe-l’œil photograph keeps the artist’s fleeting and fragile intervention suspended in the heart of public space. Shelley Miller was born in 1975 in Montreal, Quebec, Canada. She lives and works in Montreal. Shelley Miller’s objects and interventions apprehend vernacular culture in its most diverse manifestations. By reproducing contemporary society’s popular settings and consumer items in perishable materials, Miller shifts them from their usual private value. She appropriates, in the form of ephemeral decors, the poor and inhospitable supports of public space and affixes her own signs to pre-existing graffiti (Signature, 2006). She creates temporary street sculptures out of foodstuffs such as sugar, icing, and meringue, which she applies directly to wall surfaces. Her interventions are erected on anonymous building façades and in exhibition spaces, where they take the form of arabesques (Trimmings, 2002), tiles in the traditional colours of Portuguese azulejos (The Wealth of Some and the Ruin of Others, 2008), coffered walls made with cake moulds (Pipe Dreams, 2001), and advertising objects, such as the automobile used to arouse the desire for modern consumerism in India (The People’s Car, 2008). Miller’s temporary markings are superimposed over architectural elements; employing covering strategies, she momentarily duplicates the built landscape, edging it away from its original look or purpose. Her actions, which are both pictorial and artisanal — the true-to-life scale of her works updates the popular art of fresco-making — can be compared to the optical game of trompe-l’œil. Slated to gradually erode and disappear, Miller’s works highlight the contingency of the city and its symbols. Shelley Miller’s works have been presented in both solo exhibitions (Consumptuous, Access Gallery, Vancouver, 2005; Scopophilia, Galerie Articule, Montreal, 2006) and group shows (La Demeure, Optica, Montreal, 2002; Inside the Inside, The Lab, San Francisco, 2004; Saccharum BA, Museum of Modern Art of Bahia, Salvador, 2009). Shelley Miller, Cargo (The Wealth of Some and the Ruin of Others), 2009. Courtesy of the artist.